The Civic Learning and Democratic Engagement Meeting (CLDE17) held in Baltimore this month offered an opportunity for students, faculty, and staff from colleges and universities across the nation to discuss forward-looking community-building and civic engagement strategies. UMBC participants played a major role in organizing and presenting numerous sessions, tours, and special events held during the meeting, which was cosponsored by the American Democracy Project (ADP), The Democracy Commitment, and the student affairs administrators group NASPA. Additionally, UMBC’s Craig Berger, coordinator of student life for campus and civic engagement, served as the chair of the ADP’s own annual meeting, held as part of the larger gathering. UMBC community members at the 2017 Civic Learning and Democratic Engagement Meeting. During that annual meeting, the ADP honored Philip Rous, UMBC’s provost and senior vice president for academic affairs, with the William M. Plater Award for Leadership in Civic Engagement. This meaningful award recognizes the commitment of a provost to advancing civic engagement on their campus. Michael Vaughan, provost at Weber State University, presented Rous with the award in recognition of his support for creating new courses at UMBC that foster civic engagement and help students rethink their power to envision and enact change in the world. Vaughan mentioned, for example, a mechanical engineering class that partnered with Baltimore City to identify failing water pipes and a class on race, poverty, and gender where UMBC students helped local refugee high school students prepare for the college admissions process. Upon accepting the award, Rous shared with the crowd a story from his days as a student at Cambridge University, to explain his approach as UMBC provost. He noted that the entrance of Cambridge University is a very large wooden door, which itself contains a smaller wooden door, and said, “As you step through that door, it is as if you step into a completely different world.” On one side of the door he found the world was quiet, beautiful, and secluded, and on the other side it was the opposite, creating the immediate effect of excluding the broader city from the Cambridge experience and isolating the university from the dynamism of the city. As a university leader, Rous reflected, he wanted to challenge such barriers. 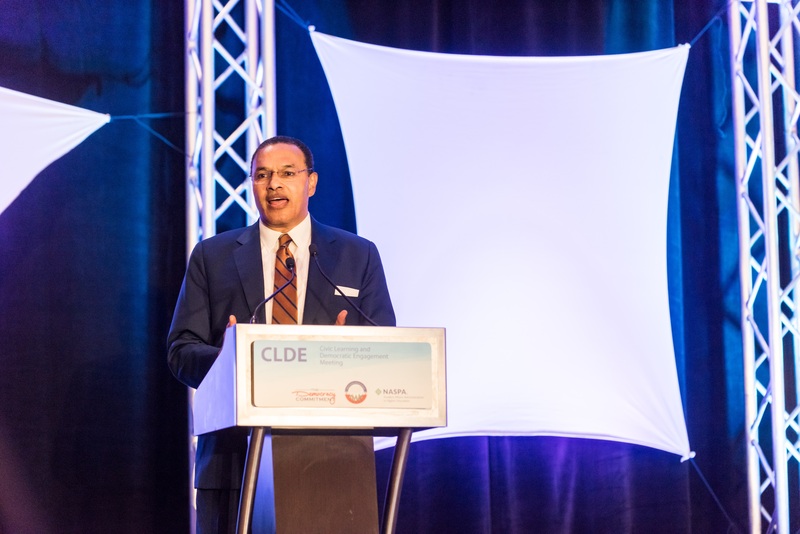 Dr. Hrabowski delivering the opening remarks during the CLDE17 plenary session. Romy Hübler ‘09, modern languages and linguistics, M.A. ‘11, intercultural communication, and Ph.D. ‘15, language, literacy and culture, who now serves as UMBC’s coordinator of student life for student organizations and involvement, worked with Jason Loviglio, associate professor of media and communication studies, to lead Tell Me What Collective Action Looks Like. This discussion session focused on how educators can help students feel inspired to take action as engaged citizens. UMBC is a leading member of the ADP, which was founded in 2003 through a collaboration between the American Association of State Colleges and Universities and The New York Times. Through innovative initiatives, ADP member institutions work to provide students with the skills and opportunities needed to put their ideas into action, on and off campus. 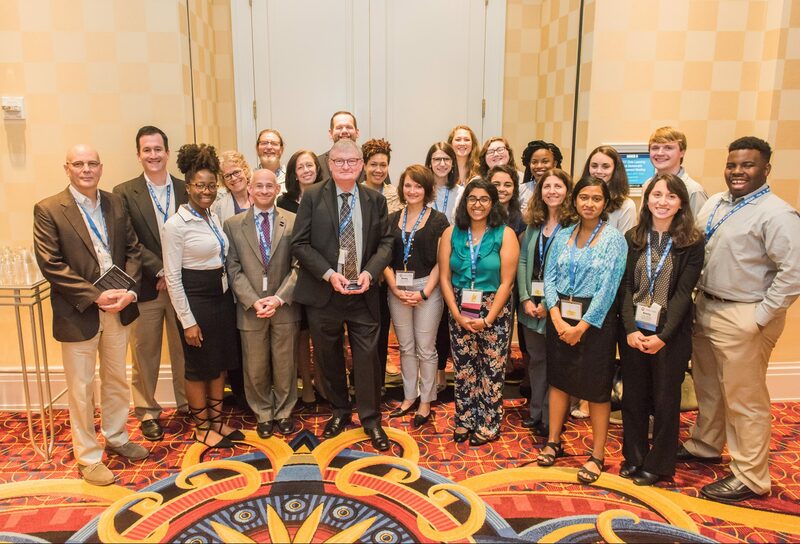 Banner image: Dr. Rous accepting the William M. Plater Award for Leadership in Civic Engagement at the 2017 Civic Learning and Democratic Engagement Meeting in Baltimore. All photos by Marlayna Demond ’11 for UMBC.